Other than my bass gear, I have a number of 6-string and 12-string guitars. I'm not a brilliant guitarist and I can't play lead guitar for toffee but playing them keeps me amused and has also improved my bass playing, mainly in terms of speed but also in other areas. In no particular order, here are my other guitars. Aria Pro II LS450 - this is essentially a Les Paul type guitar with the Aria PE style cutaway. It has a wonderful low action and plays better than most Gibson Les Pauls that I've tried. It's currently fitted with Di Marzio pick-ups. My Aria Pro II LS450 minus scratchplate. Fender Classic Player 60's Stratocaster - no collection of guitars would be complete without the ubiquitous Strat. I picked this particular model as it is very similar to the Strats played by George Harrison and John Lennon. They didn't use their Strats a great deal but that sound is noticeable on the track "Nowhere Man". This is my first Strat, in this case a Squier Stratocaster which I swapped for a Roland GR300/G303 Guitar Synth, probably not a good deal but I didn't use the Roland much whereas this Strat has had a lot of use. Epiphone Casino "Inspired by John Lennon" - This is the first of 2 Epiphone Casino's that I have. This one is the recently released "Inspired by John Lennon" version. 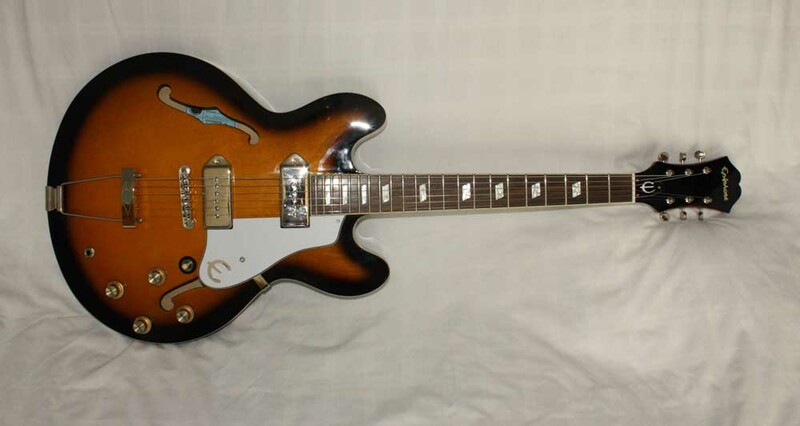 Epiphone did release a John Lennon version of the Casino which was made in the USA and cost a fortune. This version is considerably cheaper and is a very nice guitar. Epiphone Casino "Inspired by John Lennon"
My second Epiphone Casino was purchased from that online auction site and is a nice guitar, it plays and sounds well although it does have a noticeable flaw in the paintwork. I've had to replace the bridge pick-up with a Kent Armstrong job as the original just stopped working. Rickenbacker 330/12 FG - I have always liked the sound of the Rickenbacker 12-strings but it wasn't until I saw a 60's tribute band called The Piggies that I decided I would really like one. This particular guitar is in mint condition and is a compromise solution as I couldn't afford one of the George Harrison versions. The Rickenbacker 330/12 is very similar to the original Rickenbacker 360/12 but without the binding and the triangular inlays. It also has the modern pickups and the later R-style tail-piece. I have now part-exchanged this guitar for a new bass, a Rickenbacker 4001V63. (See Gear page). 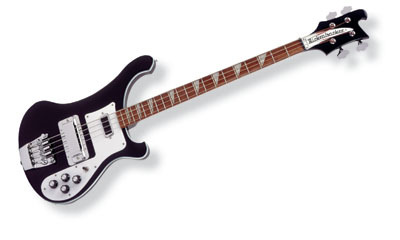 Rickenbacker 360/12V64 - this is the first of the George Harrison models released by Rickenbacker. This version was superseded by the Rickenbacker 360/12C63 which is more closely modelled on George's guitar but I'm quite happy with this one thank you very much. Yamaha APX900 Electro Acoustic - I picked this one up in Liverpool a few months ago. I saved £100 as there was quite a bad mark on the front of the guitar. Most of this polished out except for a small dent in the paintwork which is barely noticeable. Plays very much like an electric 6-string which is better for me. At one time I used to have a Minimoog, a Multimoog and an ARP Solina string machine, these have all now gone although I should have kept the Minimoog as it had a very early serial number and will be worth a rather large number of pennies! I now have a Yamaha SY22 keyboard and a couple of tone modules; a Yamaha TG55 and a Yamaha MU90R. I also have various soft-synths on my computer although they rarely get used at the moment. When Moog get around to updating the software for the Taurus 3 pedals, I will use them to trigger the SY22/TG55 when playing live. Latest addition to the keyboard stable is a Yamaha Motif XF6. What a keyboard this is, far too good for my level of playing ability but it is able to recreate a number of classic keyboard sounds including The Who's "Won't Get Fooled Again".